In the week his debut album Long Way Down was released, Brit Award-winning singer-songwriter Tom Odell played a packed-out set on the John Peel Stage at Glastonbury. The crystal clear sound of a Yamaha CL5 digital console at front of house helped inspire many in the audience to buy the album afterwards… sending it straight to No.1 in the UK chart. 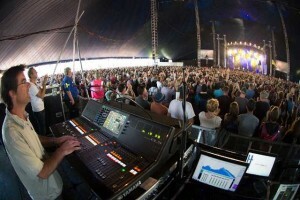 A longtime Yamaha user, Odell’s front of house engineer Davy Ogilvy became acquainted with the CL5 in his previous full-time role as a project manager at Dimension Audio. "We were looking at new digital consoles and we liked the CL5 so much that we invested in it as soon as it came out," he says. "Since then I’ve used it at a number of shows. I love the way it instantly sounds great as soon as it’s plugged in. You are immediately in a good place, which is the ideal position to start." The CL series is perfect for festival shows because of its fast setup and ease of use. "You can just jump on and get on with it. Time was tight at Glastonbury, as it is always is at festivals, so it was exactly what we needed," Davy adds. Complementing Odell’s piano, guitar and vocals are guitarist Max Clilverd and bassist Max Goff, who both play acoustic and electric instruments, plus drummer Matt Ingram. "We don’t use a huge number of inputs, about 23 overall, but the piano takes up a lot of bandwidth," Davy continues. "The key to the sound is a solid rhythm section, then fitting in the guitars and vocals around the piano. The backing vocals are quite big - all three backing musicians sing - so it’s an interesting challenge to mix. "They like a lot of reverb so I had eight reverb engines in use, plus Neve compression from the Premium Rack on Tom’s lead vocal. Another advantage of the CL5 is how quickly you can made up custom layers, which meant I had everything to hand on the surface." He continues, "I was very pleased with the Glastonbury show. Tom has a very distinctive style and sound, which the CL5 delivered with exceptional accuracy in the challenging environment of a festival tent."